Every month I’m going to be sharing an exercise or activity that will help you build a stronger brand. This month, the focus is on “strengthening your core” by helping you identify what makes your business unique and why your customers value what you offer. Have you been having a hard time explaining what your company does or how it’s unique? Do you change your elevator speech every time you give it because you just can’t nail it down? Are your marketing messages different from you website to your sales presentations to your brochures? This is a problem. Your brand messages need to be clear, unique, and consistent in order to leave a strong impression. The kind of impression that helps people remember you when it’s time to buy and trust that you are the one who can help them. To solve this problem, you need to do some work to identify your brand. How? Interview your customers! With the valuable information you’ll collect, you can develop stronger brand messages that resonate with your customers or prospects that clearly explain the value you offer them and why that is unique. Sound good? Then let’s do it! Your customers have formed a perception of your brand based on what you have told them and their experience in working with you. Every time you touch that customer – through presentations, emails, delivering the product or service, and even billing them – you have an opportunity to strengthen or weaken your brand. So, it’s important to find out what they think because if they think you stand for A and you think you stand for B, you have a brand disconnect that needs to be fixed. Your customers buy from you because you offer them something of value. So, what do they value? Why do they continue to work with you? Who do they see as your competition? Wouldn’t it be helpful to know this? 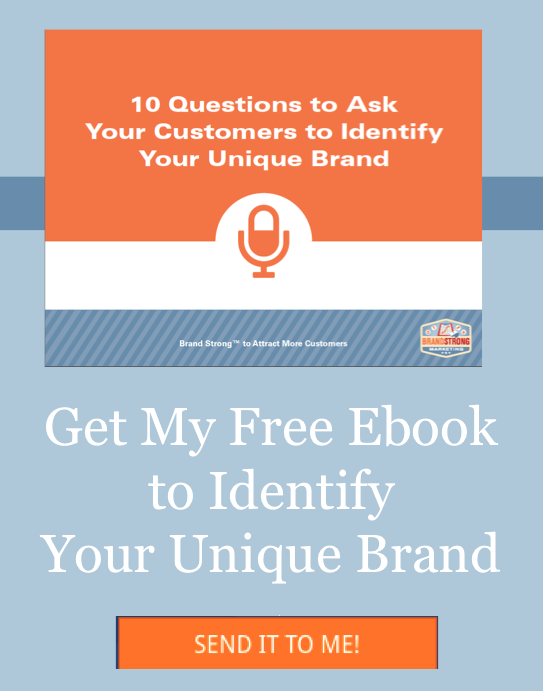 You want to identify the customers who really understand your brand and value your product or service. In other words, your best customers. Build off of their perception of your brand because you want to find more people just like them. You can interview one or two customers who maybe aren’t your best to find out why that’s the case, but you don’t want to focus on what you don’t do well. You want to focus on what you do well, so that you can replicate it more often and target the type of customer who values it. 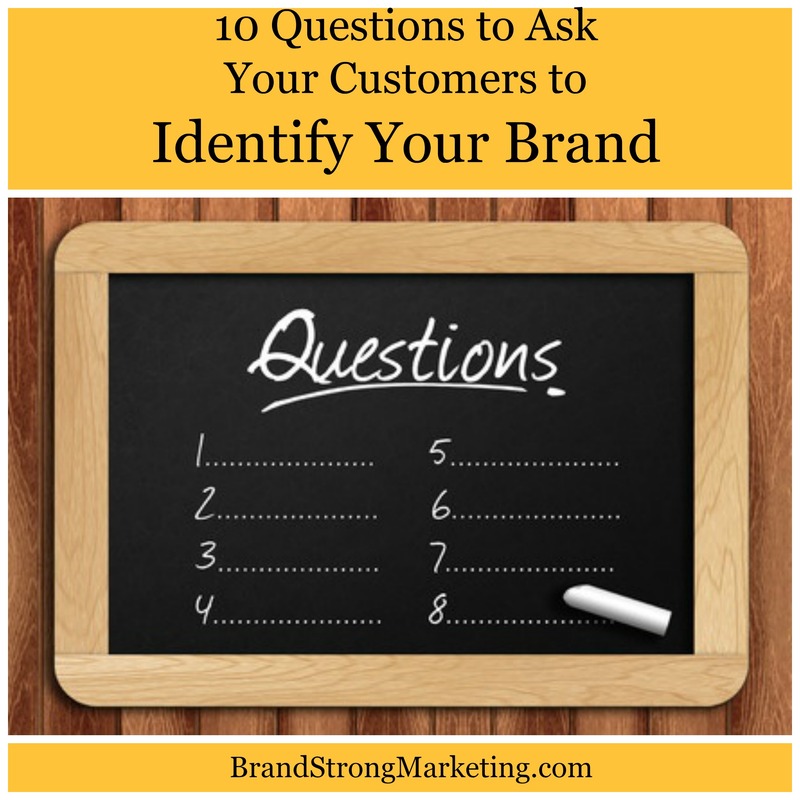 To get you started, I’ve put together a list of 10 questions that should help you unearth the value you provide and identify your brand. However, you know your business and industry better than I do, so if you want to swap out a question or add a few more questions specific to a service or product you provide, have at it! Don’t be afraid to be creative with your questions. Sometimes the more surprising the question, the better the information collected. Believe it or not, after 20 years of helping companies identify their brand, the question that gives me the best answers to identify a brand is – “If you had to describe our Company in three words, which would you choose?” It seems easy and sort of silly, but it stumps people, makes them really think, and you get at the true nature of what they value with this one question. Also, you want the emotions and feelings the person has about your company, so if they are giving you one word answers to questions, keep asking, “Why?” until you get the information you need. 1. In your words, what does our company do? 4. What is the one thing we do that you can’t get anywhere else? 5. Who do you think is our ideal customer? 6. If you had to describe our company in three words, which would you choose? 7. What do you feel is our biggest asset? 8. What did we say that made you want to work with us in the first place? 9. 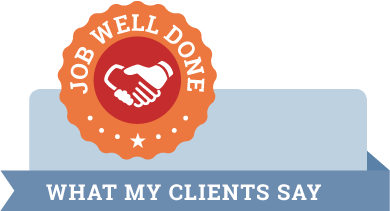 Would you refer us to another firm? Why or why not? 10. Who do you think is our biggest competitor? How are we different from them? BRAND STRONG TIP: If you can, conduct some of these interviews using Skype or Google Hangout. Why? Because if your interviewee says something great about you, you can ask them if you can use that portion of the video as a testimonial on your site, blog or social media accounts. For more advice on how to get the most from your customer interviews, see this post on the Most Important Questions to Ask to Identify your Brand. If you need help or don’t have time to interview your customers, give me a call at 847-963-1805 or shoot me an email at sue@brandstrongmarketing.com.